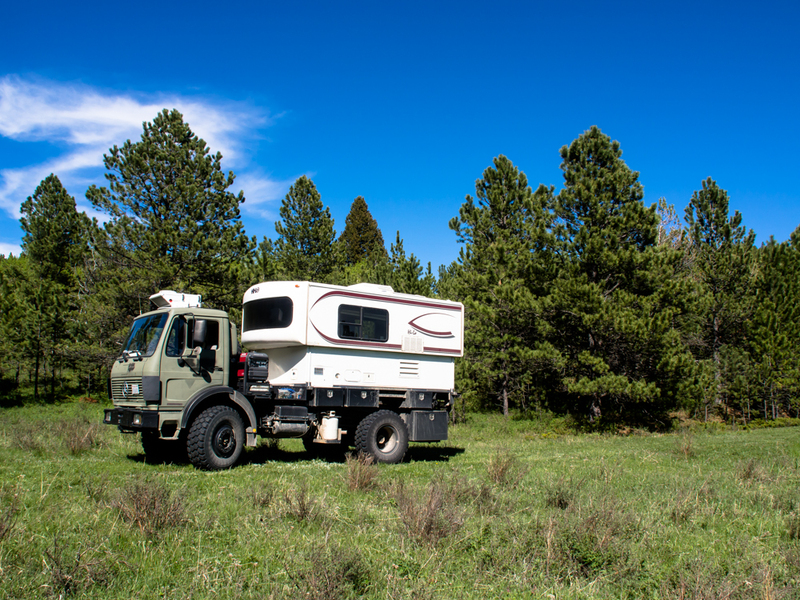 We spent the night at a remote campsite near Rock Creek. We were all by ourselves and the site was nice. The weather was good to us: not windy and it did not rain. 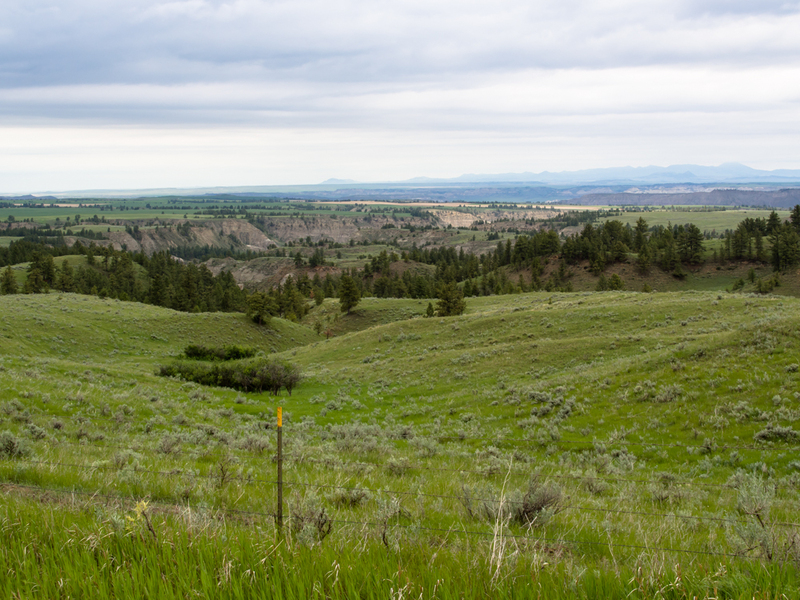 Rain, as it turns out, turns Montana dirt roads into mush. We left Rock Creek and headed north. From our camp at Rock Creek we had a nice view of the steep cliffs to the west. 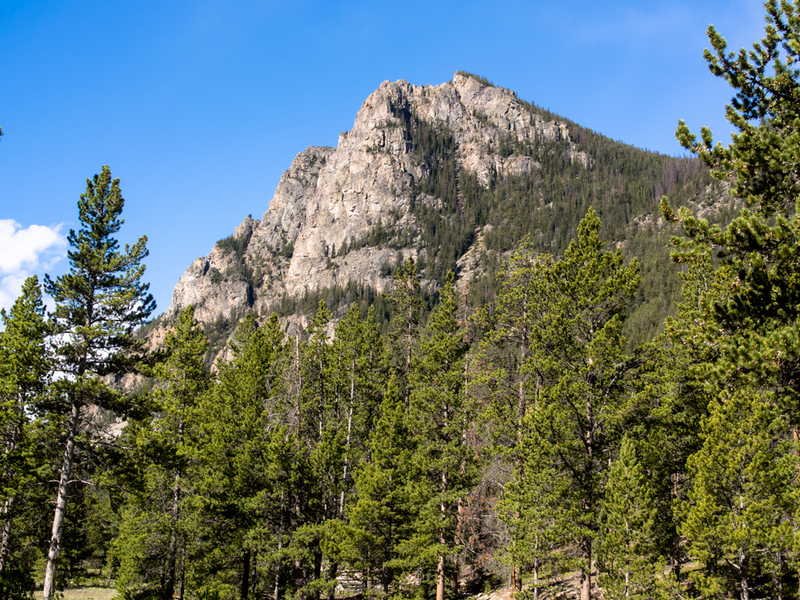 We traveled north to Red Lodge, MT for a resupply. 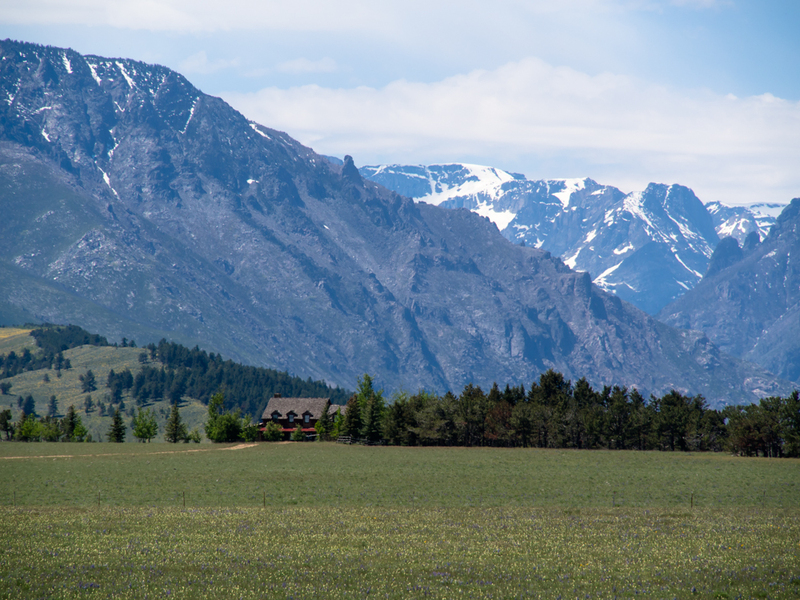 From Red Lodge, we headed west along the north edge of the Beartooth range. Looking south from the road, we had a nice view of the Beartooths. 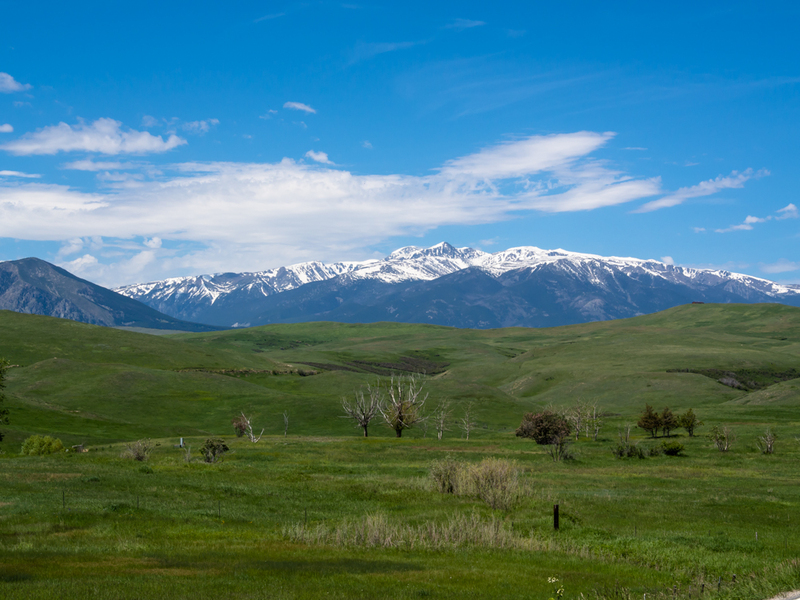 The Beartooth range is large, tall and rugged. We saw some shacks along the highway, but this was not one of them. This ranch clearly belongs to a city refugee. 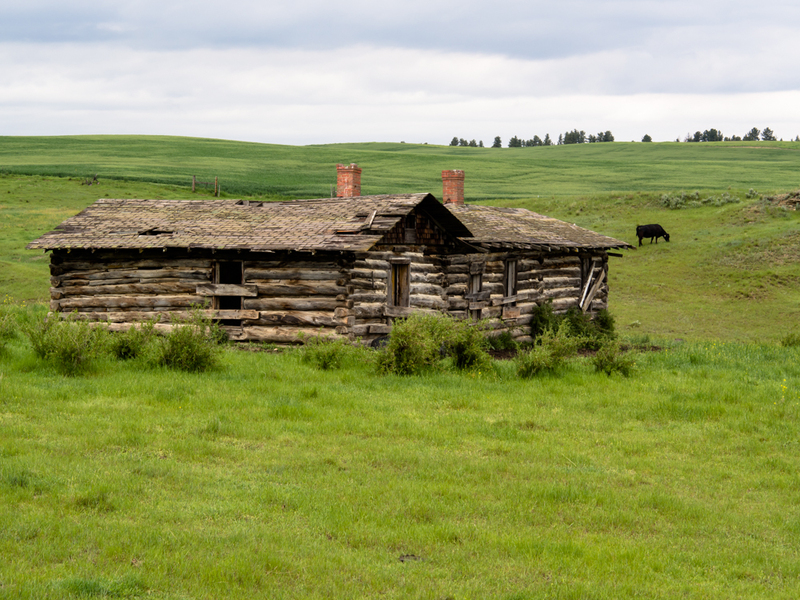 No self respecting Montana rancher would live in a place like this. But, the view of the Beartooth canyons was off the chart. 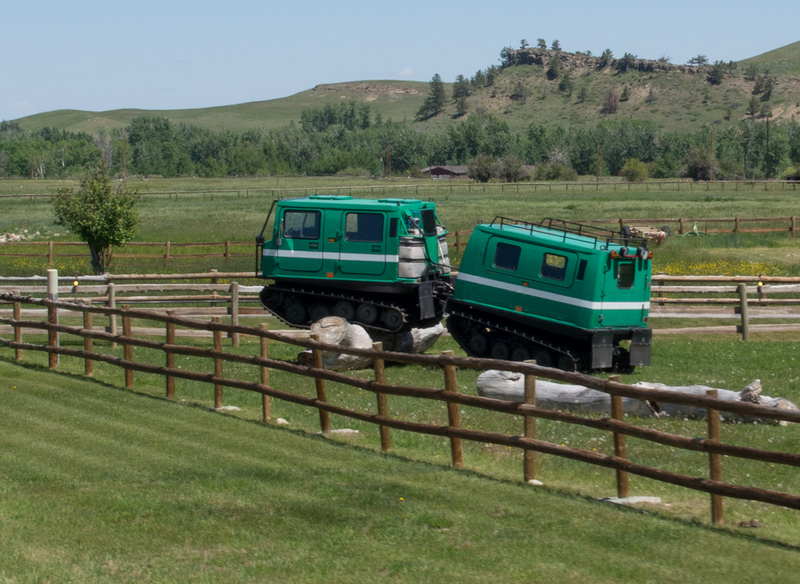 One of the ranchers along the highway had a set of Hagglund snow machines. This one was parked near the road, but there were others it his yard. We continued north through farm lands, and then headed up into the hills on our way to Ryegate. From the lip of the cliffs, we had a great view of the valley. 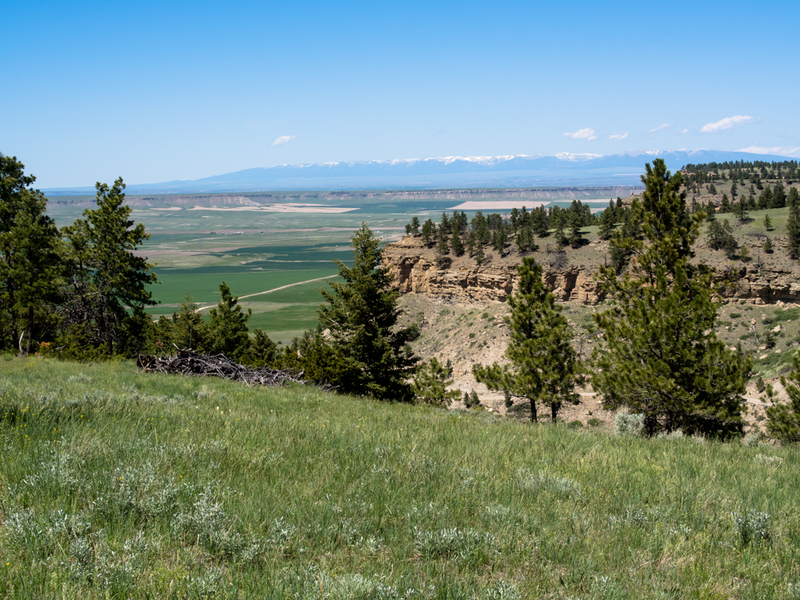 From the top of the mesa, we could see into the Big Coulee valley. 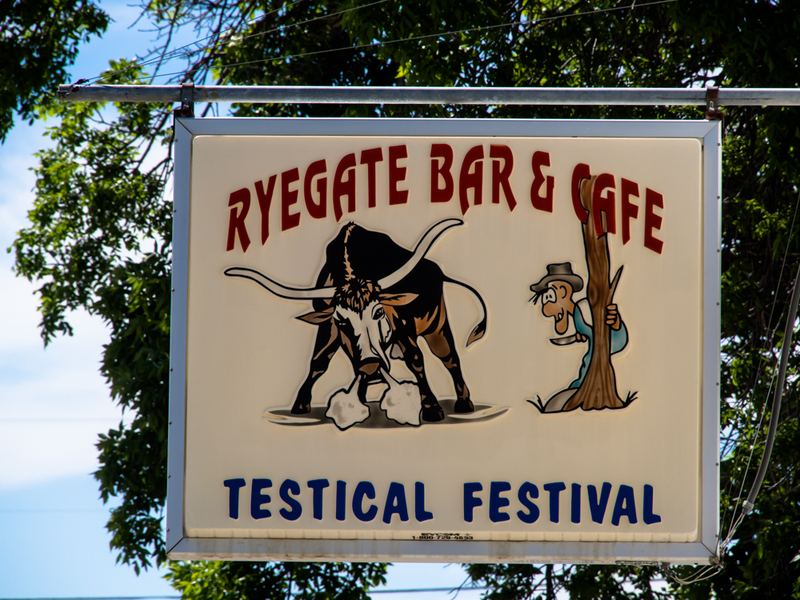 We spotted this sign in Ryegate. This, of course, refers to changing bulls into steers. It was nearing sundown and we were coming close to the crest of the Little Snowy Mountains, so we pulled off the dirt into a nice meadow for the night. 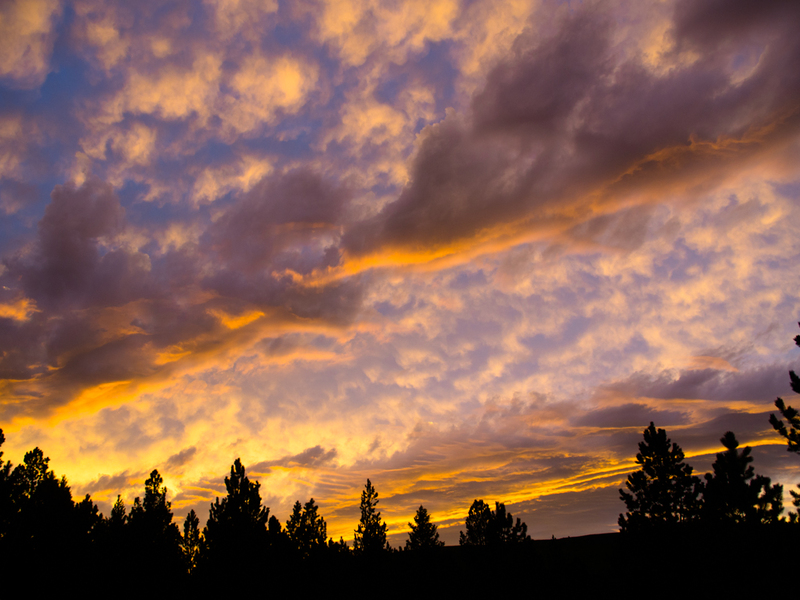 The leading edge of a front was moving through the area but it did give us a respectable sunset (for Montana anyway). Despite the fact that we were several hundred yards from the road, we were awakened near dawn by the cracking of a whip and the bawling of cattle. It turned out that our meadow was on the path of a cattle drive. The herd passed us and several hours later as we were making our way north, we passed them. 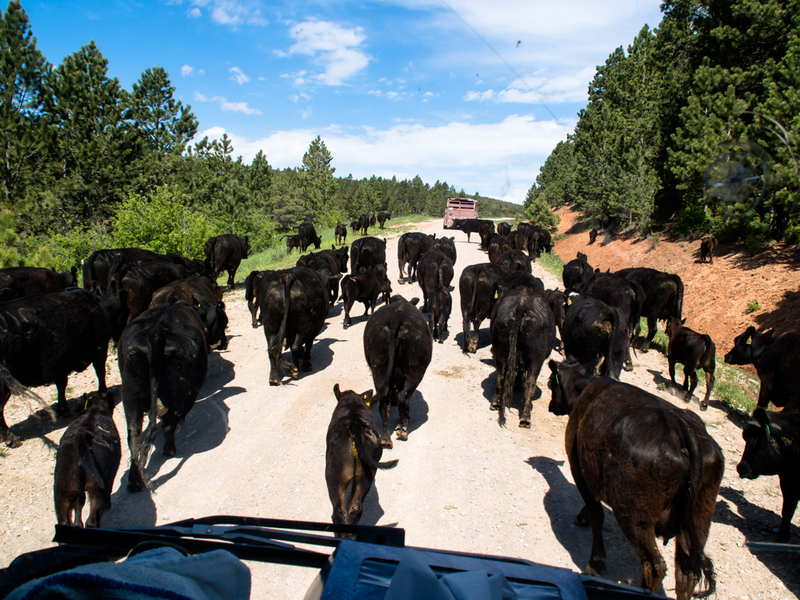 Another traffic jam, Montana style. The cattle could care less about Thor and we literally had to nudge them out of the way to get past. The truck with stock trailer in front of us had already pulled through the herd and was driving away. There was enough rain this spring to bring out the flowers. This patch of purple was particularly dramatic. 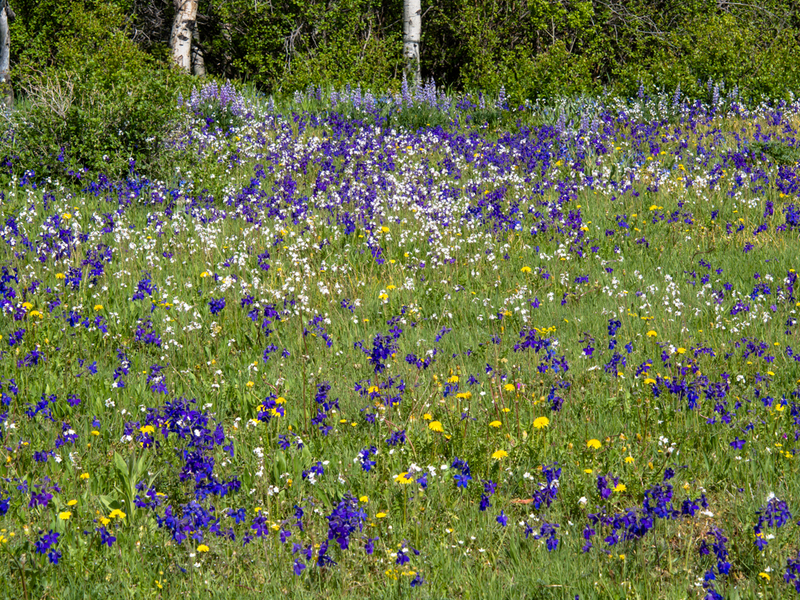 A short distance up the road the purple flowers were intermixed with whites and yellows. 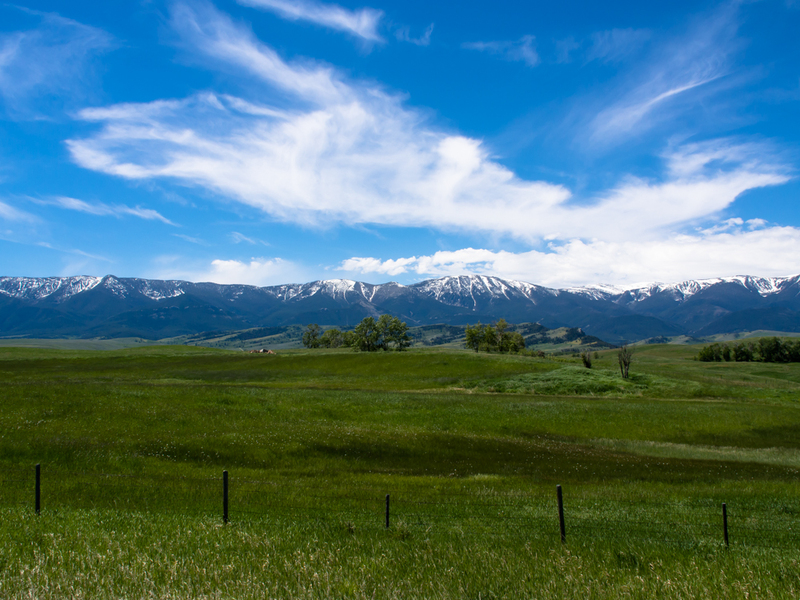 It was overcast and threatening rain when we pulled into Lewistown, MT. 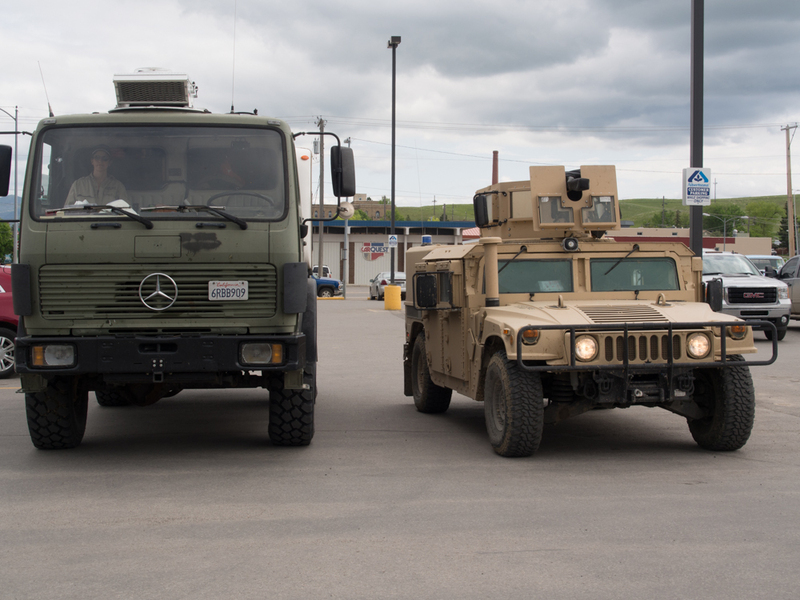 We stopped at the Albertsons and spotted this active-duty Humvee with 40mm canon in the parking lot. Never one to pass up the opportunity for a comparison photo, I pulled along site. 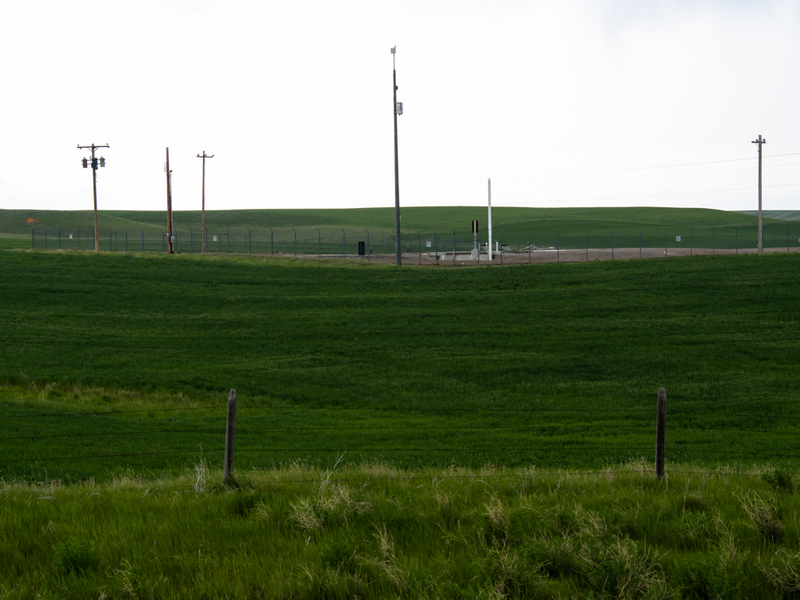 This rig is used to provide security for the many Minuteman missile sites that are close. These are nuclear-armed missiles, so security is rigorous. There were dozens of missile silos in the area. We passed several but there is not much to see above ground: just some warning signs and a fence. This was a hard way to live "back in the day". Quite cold in the winter. 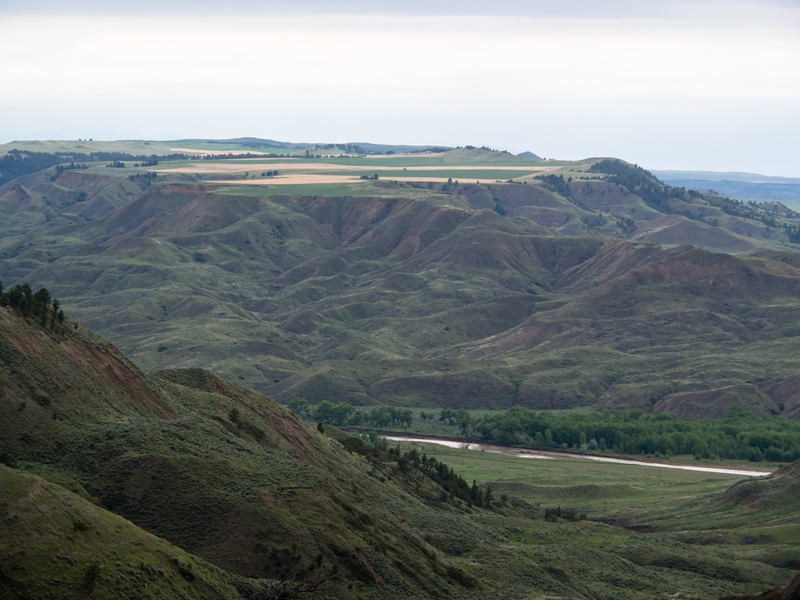 From the crest of the hills north of Lewistown, we could see the Missouri Breaks: a set of cliffs produced by the Missouri River and its local tributaries. As the road descended into the river valley, we could see the steep cliffs produced by erosion. The tops of the mesas all had active farms. There was a historic marker at the bottom of the canyon telling the story of Lewis and Clark in this area. 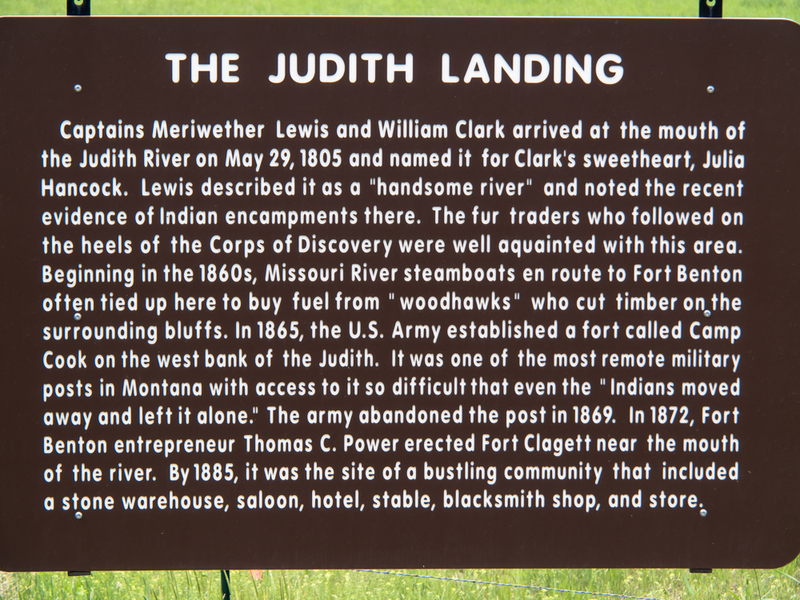 We followed the Judith River to its confluence with the main Missouri to a camp area called Judith Crossing. There were a few folks there, but our area of the camp was empty. The grass had been recently mowed and it looked like a park. We were right on the banks of the river. 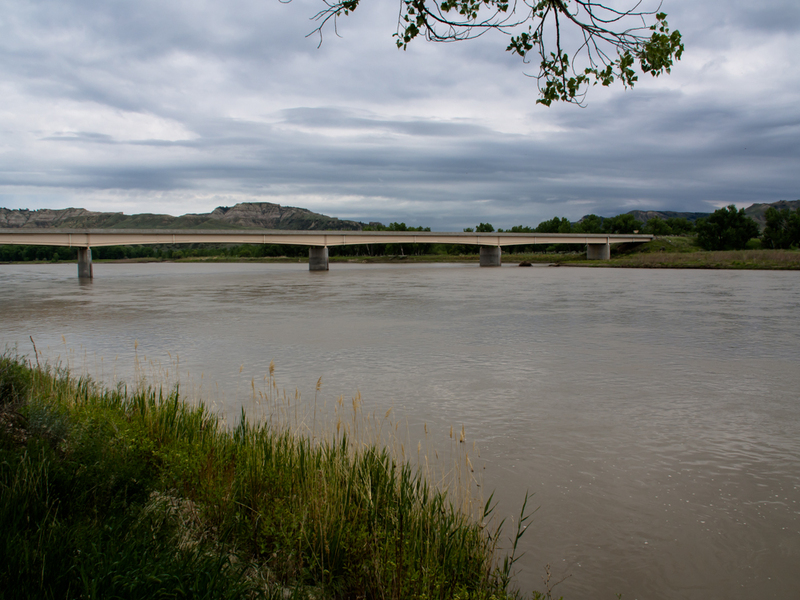 From our camp we had a clear view of the so-called PN Bridge, named for the PN Ranch just across the river. The PN Bridge is new and was very large considering the road was dirt. But upon further consideration, I realized that portions of the river develop ice flows and the bridge has to be stout enough to handle the flows crashing into the bridge pilings. 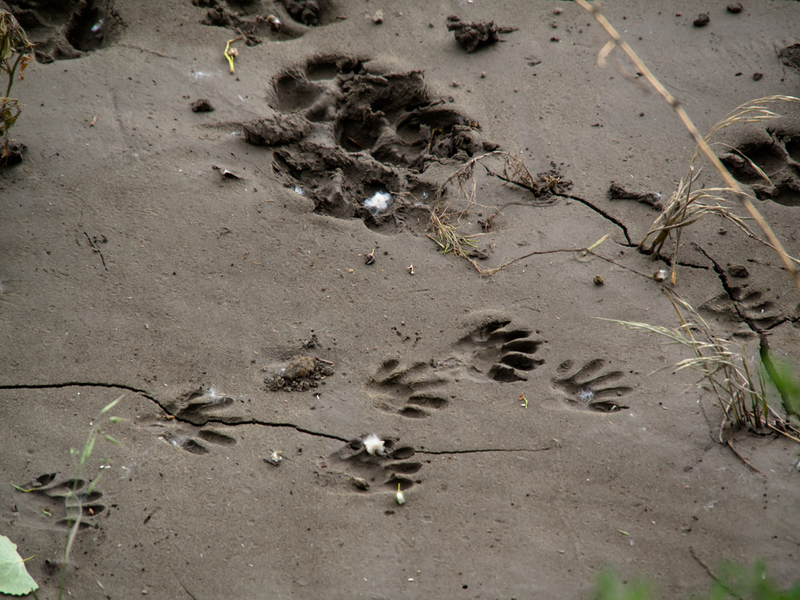 I looked over the lip of the river bank to the soft mud along the bank and spotted these tracks. The big one at the top center was about 4" across. 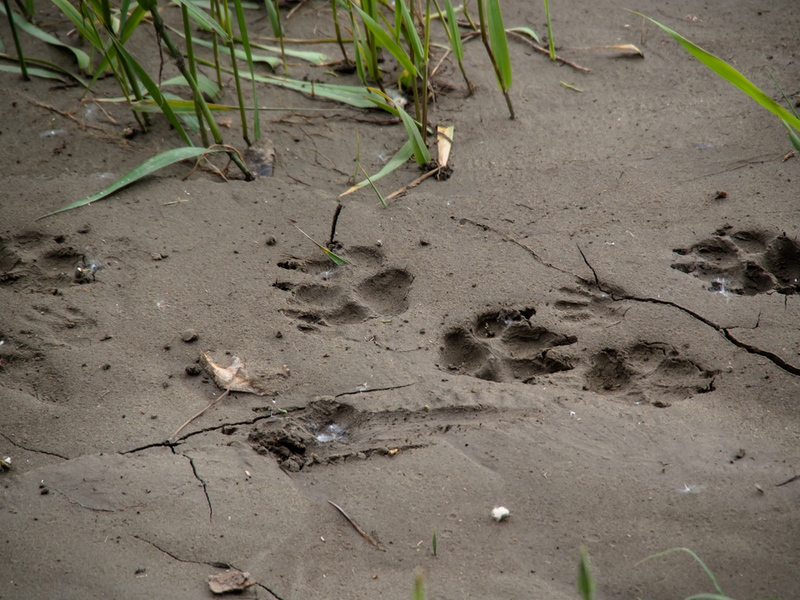 Kathleen and I guessed that the small tracks were from a rather large raccoon. 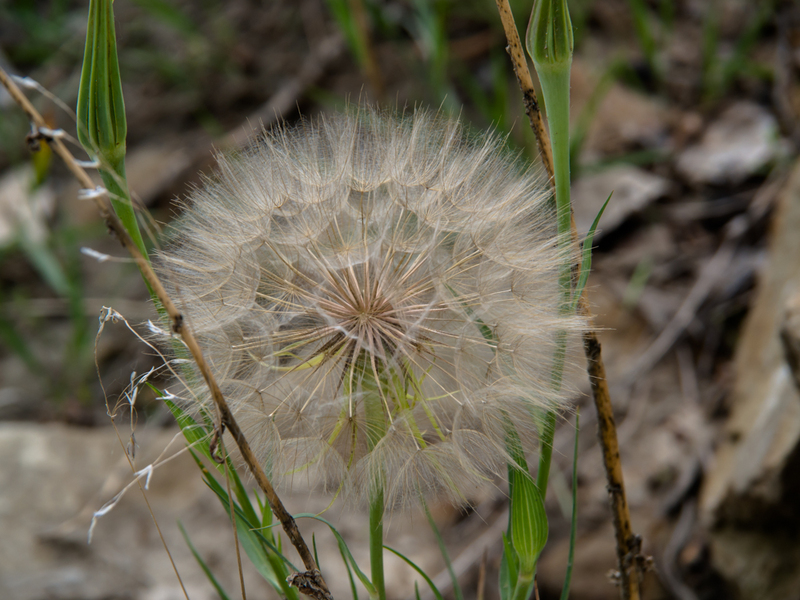 This dandelion bud was huge: perhaps 6" in diameter. There was a threat of rain all night but it never really fully materialized. The 40 mile dirt road from Judith Crossing finally turned into asphalt and we were met by a pilot truck waving a "wide load" flag. Usually this means a farmer hauling a tank or a trac-hoe, but in this case it really meant a wide load. Because the ditches along side the road were steep and muddy, the driver held his position until we could get onto the side road to allow him to pass. This was a full-sized house. 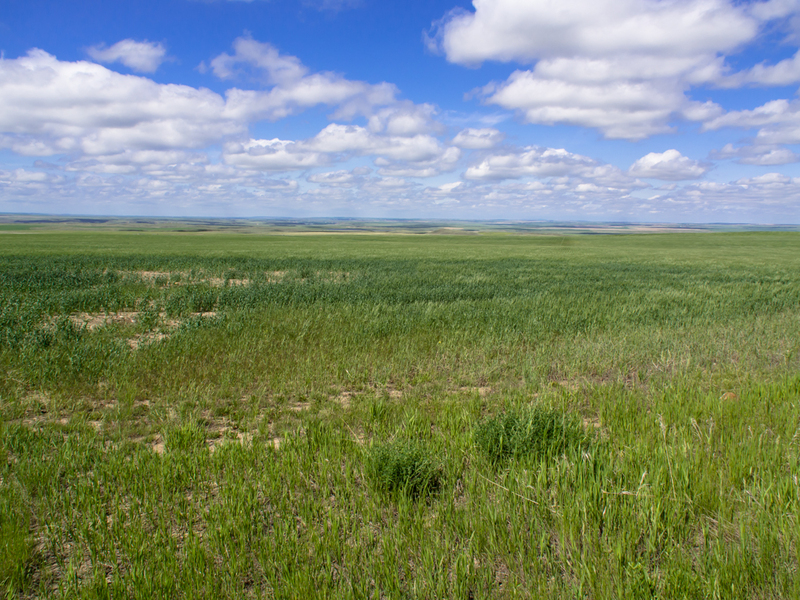 While we were waiting for the house to pass, I did get a nice shot of the rolling prairies to the east of Big Sandy, MT. 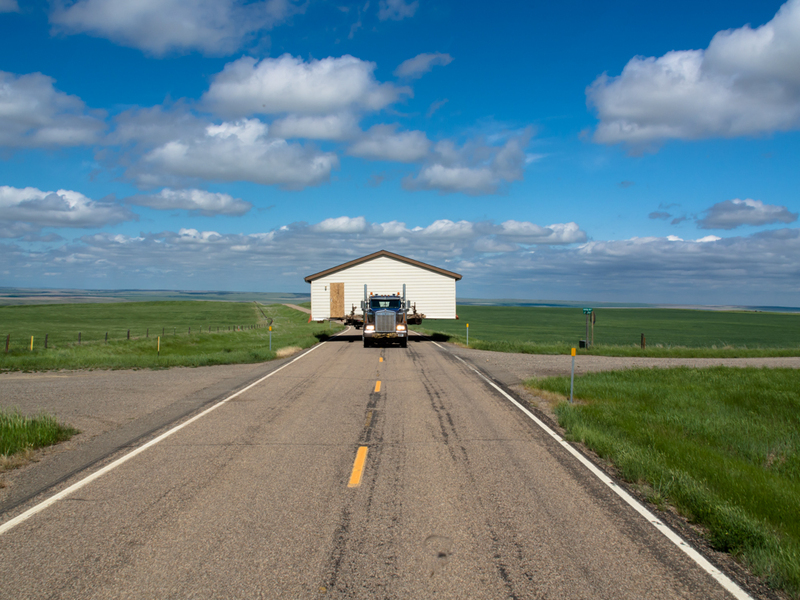 We went south from Big Sandy past Fort Benton. 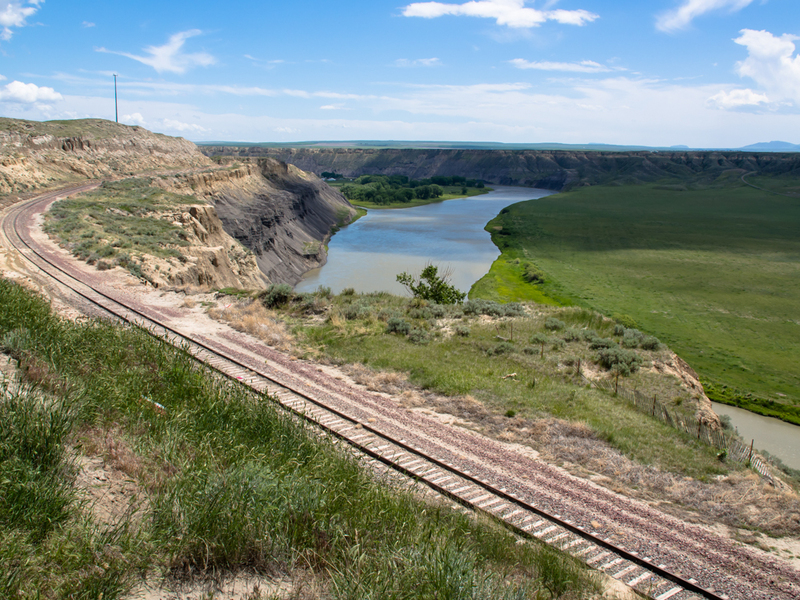 Fort Benton was the upper-most point of steamship travel on the Missouri River. Benton is just around the bend past the island. 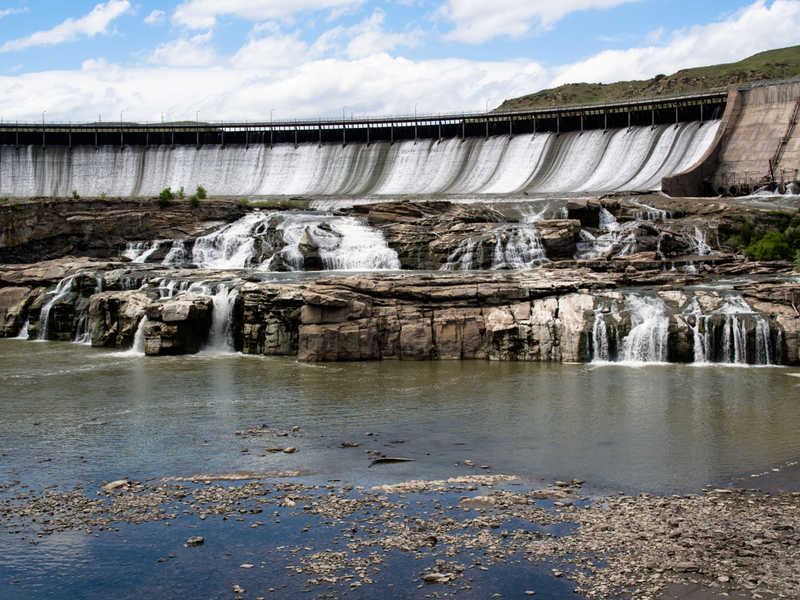 We saw a sign for the "Great Falls of the Missouri River" so we went to investigate. 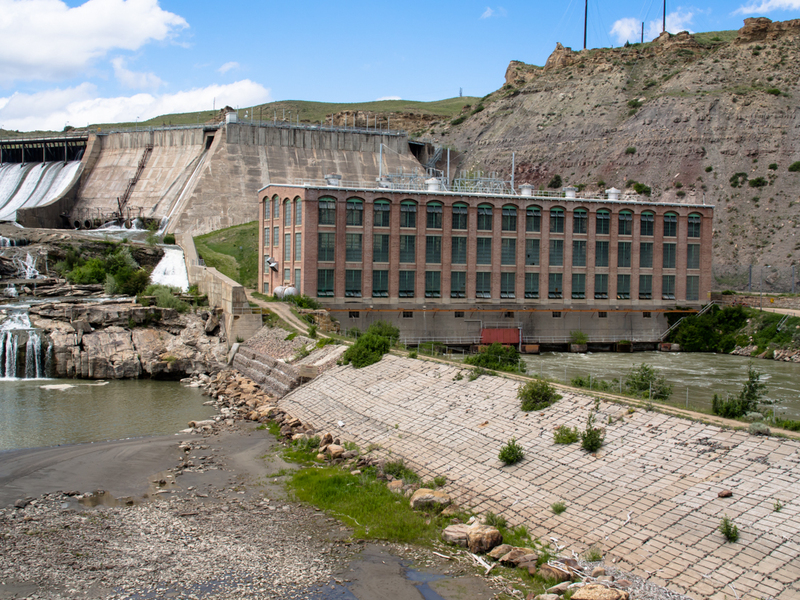 We found a vintage 1900s dam and powerhouse that was still in use. 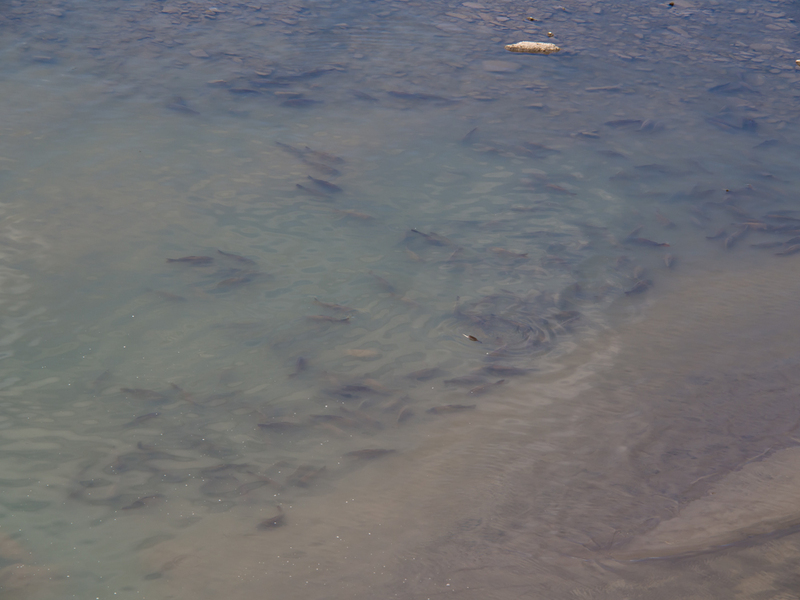 The tail race area was filled with these huge fish. 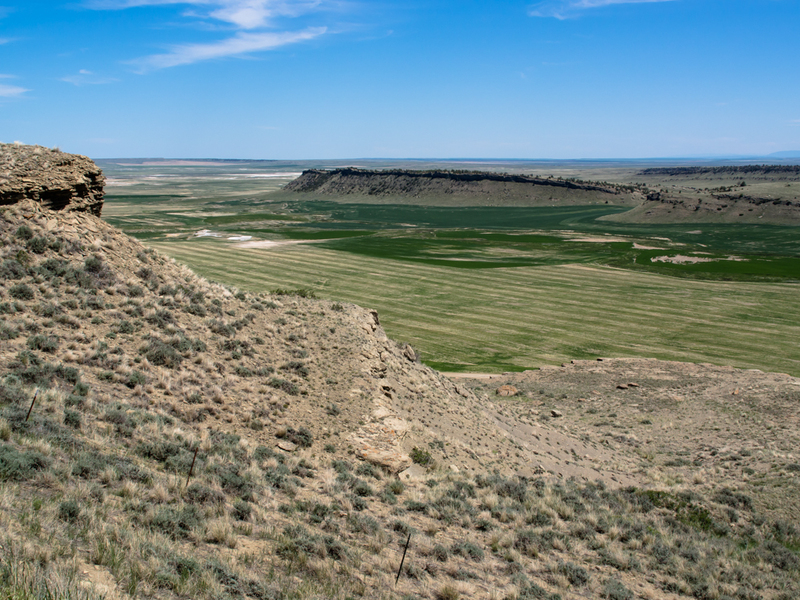 When Lewis and Clark first saw this area, the entire flow of the river cascaded over these cliffs. 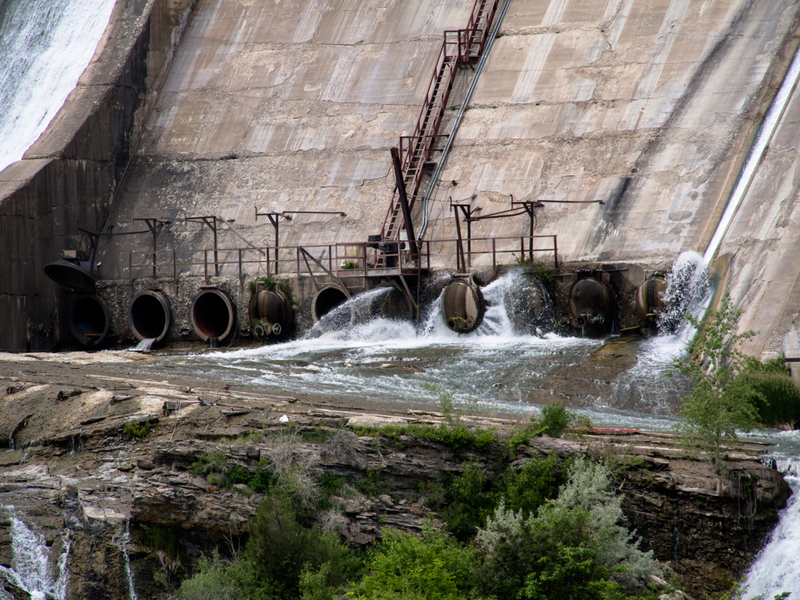 Now, the dam holds back the flow and forces it through the powerhouse. The concrete face is showing its age. I think there is some kind of leak coming out from the cap. This segment of the trip brought us through some very interesting and scenic country. 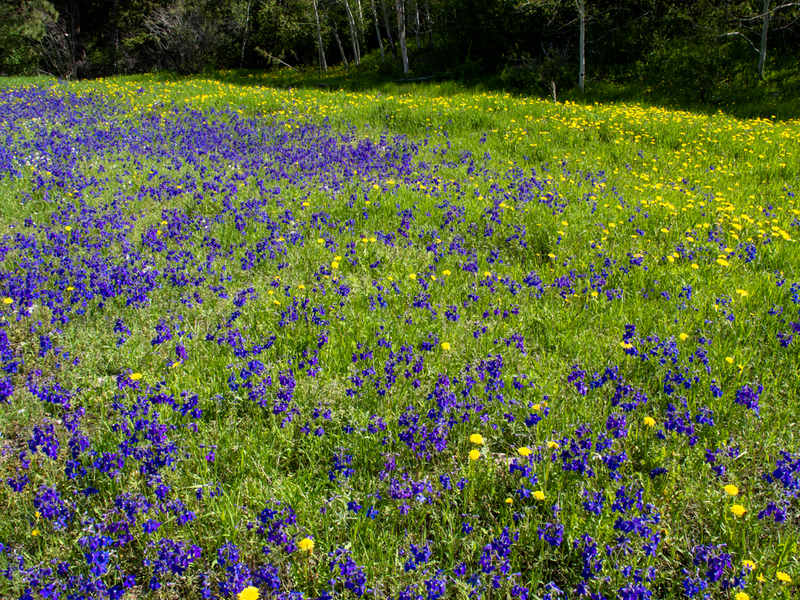 The rolling grasslands were verdant green from the spring rains and covered with flowers. We both liked Lewistown, MT; the country sherriff stopped to visit while were were at a fuel stop. They were all friendly folks. 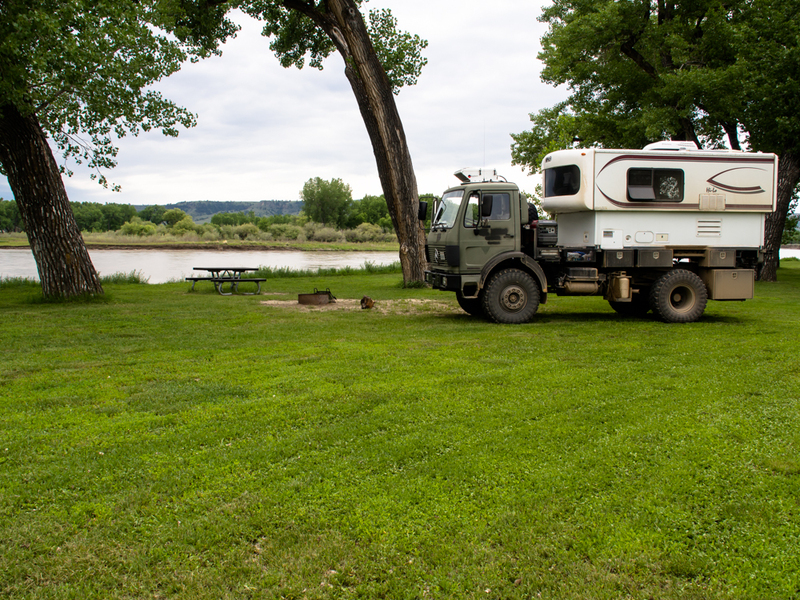 We ended this segment of the trip at an RV park in Great Falls, MT. We needed to shower and do laundry as well as a trip to the state liquor store. Tomorrow, we head north toward Glacier National Park..